Gibson first introduced the Melody Maker into its catalogue in 1959. Initially, it had a body shape similar to that of the Les Paul Junior, but was slightly thinner, and featured a simple inventory including an all-mahogany build, a single pickup, wraparound bridge/tailpiece, controls mounted on the pickguard and an unbound neck with dot inlays. It was aimed at being a no-frills budget model in counterpoint with Gibson’s prestige electrics, such as the ES and Les Paul ranges. Things were set to change, however, and the body shape underwent several redesigns during the 1960s. 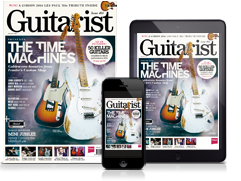 By 1961, for instance, the Melody Maker had a double-cutaway and a year later was offered with an optional Maestro tremolo. Our model here represents possibly the most radical change: an SG-type double-cut - introduced in 1965 - with three single-coil pickups and a tremolo, possibly a reaction to the burgeoning popularity of Fender’s Stratocaster. Nicknamed the Melody Maker III, the pickups were high output, with a three-way selector switch mounted on the lower horn. 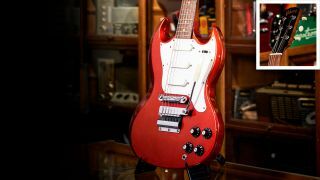 The colour of the ’67 is another rarity; the SG-shaped Melody Makers usually came in either Fire Engine Red or Pelham Blue, but this is the unusual metallic custom colour, Sparkling Burgundy, making this particular instrument of great interest to the collector market. As you can see, the Melody Maker’s condition is excellent and we’d like to thank Guitars - The Museum in Umeå for allowing us access to this super-rare instrument.